A strict immigration policy has helped make Japan one of the world’s oldest and most homogeneous societies. Now, Prime Minister Shinzo Abe’s plan to invite as many as half a million foreign workers is testing the country’s tolerance for change. Abe is preparing to introduce legislation to allow migrants to start filling vacancies next year in sectors worst hit by the country’s shrinking population. While the government hasn’t released a target, local media including Kyodo News have reported numbers that would represent a 40 percent increase over the 1.3 million foreign workers now living in the country. In a sign of urgency, Abe’s government has announced an April start date for the policy even before debate has begun in the Diet. The proposal is among the first he’s seeking to tackle after winning a historic third term as head of the ruling Liberal Democratic Party last month, paving the way for him to become the country’s longest-ever serving prime minister. If passed, the legislation would amount to Japan’s most dramatic immigration overhaul since the 1990s, when it let “trainees” from Asian nations in the country. Foreigners made up only about 1.7 percent of the country’s population as of April, compared with 3.4 percent in South Korea and about 12 percent in Germany. 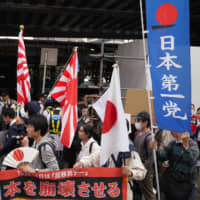 Abe got a reminder of the risks Sunday as more than 100 noisy protesters marched through Tokyo’s upmarket Ginza shopping district, waving Imperial army flags and urging the plan’s withdrawal. Although the group was outnumbered by police and pursued by counterprotesters chanting “racists go home,” they appeared keen to tap into anti-immigrant sentiments that have bubbled up elsewhere in the developed world. 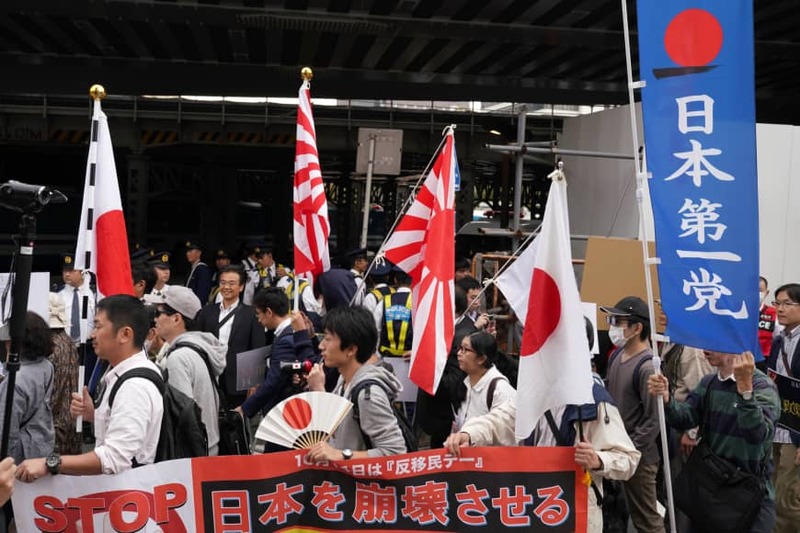 The organizer calls itself Japan First, an allusion to U.S. President Donald Trump’s “America First” policies. The risks of inaction could be just as great, as Japan’s declining population takes its toll on the economy. In a survey published by the Japan Chamber of Commerce and Industry in June, two-thirds of companies said they were short of workers. 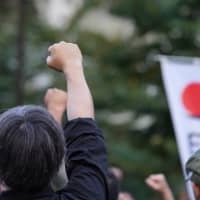 The number of companies folding because of a lack of workers jumped by 40 percent in the first half of the financial year, compared with the same period in 2017, according to Teikoku Databank Ltd.
Abe’s plan, set to be introduced in the parliamentary session beginning later this month, calls for creating two classes of foreign workers to serve in about 10 as-yet-unspecified industries. Lower-skilled migrants would be allowed to stay for as long as five years and barred from bringing their families. More highly skilled workers could bring family members and stay longer. Chief Cabinet Secretary Yoshihide Suga said earlier this month that the total number of new workers hasn’t been determined. Mikio Okamura, the head of the Tokyo chapter of Japan First, called for the government to spend money on improving pay and conditions for Japanese citizens, rather than relying on foreigners. 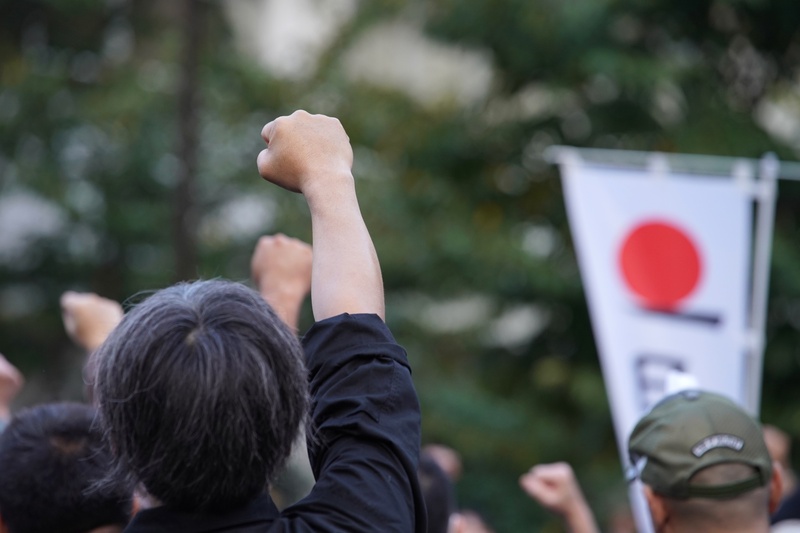 Other more mainstream groups have expressed concerns, with Japan’s Trade Union Confederation questioning the lack of public debate in a letter submitted to the government in August. The group, known as Rengo, has said that foreign workers shouldn’t be accepted without careful consideration. Japan has had a difficult history with attracting foreign blue-collar workers. The country invited in Brazilians and Peruvians of Japanese descent when the economy was growing, but ended up offering to pay them to leave after the 2008 financial crisis. A system of accepting mostly Asian “trainees” — launched in 1993 and officially intended to transfer skills to developing countries — turned out mostly to provide a supply of labor at less than minimum wage, while often preventing participants from leaving jobs where they were treated badly. Japanese media regularly report on foreign students struggling with massive debts owed to the shady brokers who bring them over. Some of these issues are tackled in an outline of the coming legislation published on Oct. 11. Under it, foreign workers must be paid at least as much as their Japanese counterparts, and they will be allowed to change jobs within the same sector. Nevertheless, their presence will hold down wages, some economists say — working against Abe’s six-year push to raise incomes and fight against deflation. The influx of labor will also hold back necessary progress in improving productivity, said Yoichi Kaneko, a former lawmaker and Organisation for Economic Co-operation and Development economist, who now works for an IT firm.